Cat’s Claw / 60 Caps - Nature's Way®. Take 1 capsule twice daily with water between meals. Are the NW Cat's Claw products TOA free? Nature's Ways Cat's Claw contains the root bark of the plant, Uncaria tomentosa. 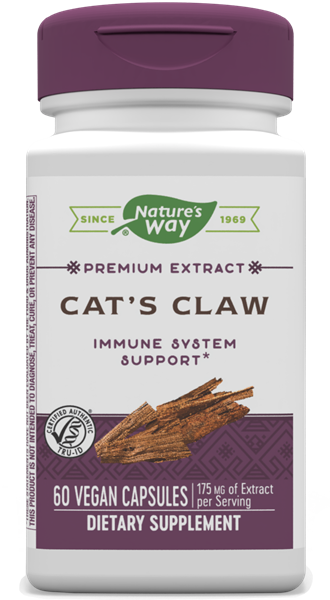 Nature’s Way Cat’s Claw products are analyzed for total pentacyclic oxindole alkaloids (POA) and tetracyclic oxindole alkaloids (TOA) content. Recent product analyses have shown the listed amount of POAs, whereas TOAs have not been detectable. Early research on cat’s claw focused on pentacyclic oxindole alkaloids (POAs) and the removal of TOAs. However, some more current research has used cat's claw with minimal amounts of naturally occurring tetracyclic oxindole alkaloids (TOAs).